Vespasian’s Camp, so called by antiquarian William Camden (there is no connection with the Roman Emperor), is an impressive Iron Age promontory fort situated on a chalk spur rising to a height of 102m above OD on Salisbury Plain close to Amesbury. 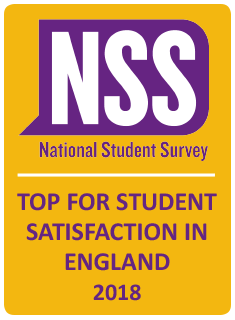 The spur was surrounded by important sites and monuments throughout prehistory and is intervisible with the Stonehenge Avenue, West Amesbury Henge, Coneybury, King Barrow Ridge and the River Avon. The place might have been expected to have had signiﬁcance for the Plain’s early inhabitants on the strength of its location alone. It is widely assumed that much of the Camp’s archaeology was destroyed by the Duke and Duchess of Queensberry’s landscaping of the area between 1726 and 1778 (Hunter Mann 1999, 39-51) and by modern building work (Lindford 1995). It is this reason why the area hasn’t been subject to detailed archaeological investigation before. However, between 1999 and 2003 my examination of various 18th-century property deeds and estate records, including those from nearby farms, revealed for the first time that the north-east part of the site had largely escaped landscaping. This research effort (and work since: see Haynes 2012) has revealed a new, more complex, timeline for the Queensberrys’ acquisition and development of the land. 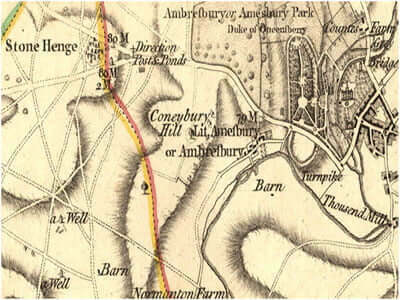 1725 – 1726: The Duke and Duchess of Queensberry inherit the Amesbury Abbey Estate. This contained a holding of five acres on nearby Vespasian’s Camp, then known as ‘The Walls’. The Flitcroft Survey of 1726 provides information on field ownership and usage around Amesbury (Fig.1). It shows that the majority of field strips within the ramparts of Vespasian’s Camp (‘The Walls Field’) were owned by other landowners. The land south-west and north of them wasn’t owned by the Queensberrys. Fig.1: Part of the 1726 Flitcroft Survey: Vespasian’s Camp, then known as ‘The Walls’, is shown in the top right corner. The majority of the field strips across the centre and north end of the Camp were not owned by the Duke and Duchess of Queensberry at thist time. 1735-1742: The ‘Walls Field’ area of the Camp becomes part of the Queensberry Estate, field by field, over this seven year period. As late as 1741, twenty-five acres of it were still being leased out, so the Queensberrys would not have been able to fully landscape the area then. 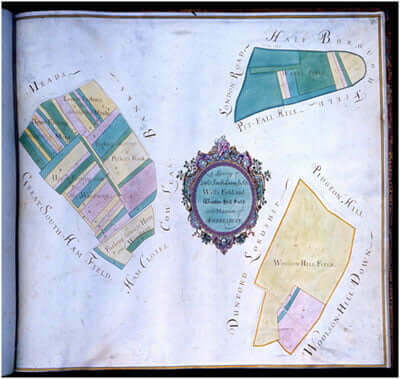 The 1742 Queensberry Estate Survey shows that all land in Walls Field was enclosed by the Estate. However, two of the field strips within it continued to be controlled by tenants, which may have restricted the landscaping effort. 1738: Charles Bridgeman’s landscaping designs for the Abbey and for parts of the Camp are published (Fig.2) There is no evidence for any landscaping plans for the north, north-east or southern sectors of the outer hill fort, as the Queensberrys did not have control over them (see below). Bridgeman, who died in the same year the plans were published, does appear to have had his plans for the Abbey mansion area and some for the interior of the Camp in the illustration, later realised. 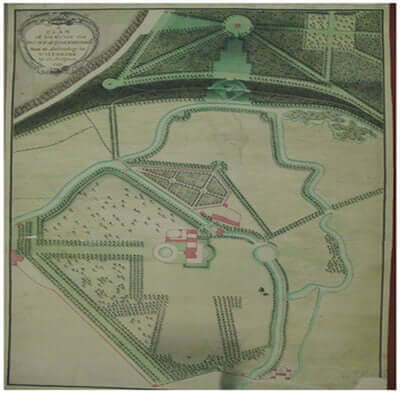 Fig.2: Charles Bridgeman’s landscaping designs for Vespasian’s Camp (top of drawing) and the Abbey Mansion area were published in the year he died (1738). His plans for the Abbey Mansion appear to have been realised, along with some key elements of his designs for the interior of the hill fort (top centre). There is no evidence for any landscaping designs for the south (left), north or north-east sectors of the Camp. 1748: The Chinese Summer House is built in the north-eastern / eastern area of the Camp on Abbey mansion grounds over the spring line. This is missing from Bridgeman’s plan and is suggestive of the family’s landscaping tastes changing. 1750: The Estate imparks 360 acres of farmland to the north and west of Amesbury for hunting. There is no evidence for landscape garden design in this area at this time. 1760: 35 years after taking over the Estate, the Queensberrys finally purchase Countess Court Manor, which becomes the north-east boundary of the broader Estate area at this time. The manor contained a working farm ‘Countess Farm’, and Blick Mead. There is no evidence of landscaping here. 1771-1789: The Crow Survey of 1771 describes the terrace above Blick Mead as ‘The Slang’, an old topographical field name describing the ‘sling’ shape of the land here (the shape came from the lynchet terrace along the spring basin’s contours). It is described as being “next to Countess Farm”, rather than next to Vespasian’s Camp. Christopher Ingram’s Estate papers of 1788-1789 indicate that Countess Farm continued as a cattle farm and had sheep grazed on its downland. Blick Mead may have been a useful source of water for these livestock. 1773: The Andrews and Drury Map (Fig.3) of the interior of Vespasian’s Camp and its broader area is likely to provide an accurate record of the extent of the landscaping at Vespasian’s Camp at this time (Tim Mowl, pers. comm.). Landowners were the biggest subscribers of county maps and surveyors were likely to record what they owned accurately. Fig.3: The Drury and Andrews Map of the Vespasian’s Camp and Stonehenge area (1773). The north, north-easterly and southern sections of the Camp show no evidence of landscaping. Blick Mead can be located under the ‘U’ of ‘Countess Farm’. The map shows access to the Camp from the Abbey mansion (the building centre right of the Camp) via a path running in a north-westerly direction. This continues to the imparked land to the north-west. There is a connection with a path to the south which runs to the interior of the Camp. The low lying Blick Mead area in the north east is separated from the landscaped area by an avenue leading north-westwards towards the park and downland. It is likely to have been a ride and its view of Blick Mead and Countess Farm largely obscured by trees. 1777- 1778: The Duke and Duchess of Queensberry die and the heir to the Estate, the 4th Duke of Queensberry, decides not to live in Amesbury. From 1778 the parkland around the Camp was swiftly disparked and returned to farming. The acquisition of the land at Vespasian’s Camp between 1725 and 1760 was a complicated and piecemeal process. The Blick Mead basin in the north-east area of the Camp was not subject to garden landscaping. It wasn’t owned by the Queensberry Estate until 1760 and was probably tied to Countess Farm. The water source at Blick Mead is an ancient springhead, not an 18th century water feature, as conjectured. Blick Mead is separated from the rest of the Camp, and other springs on the spring line, by a mid18th-century avenue which was tree lined. The area due north of the ramparts was mainly used for hunting purposes from 1750 – 1778. There is no evidence for garden landscaping here. The areas to the north and north east of the Camp’s ramparts are likely to have high archaeological potential. They were not subject to garden landscaping programmes or modern ploughing. The area south of Stonehenge Road may have high archaeological potential for similar reasons, but early 20th-century housing has probably denuded this in some locations.